The updated eBook versions of The Newtonberg Stories are now available! 1. Log into your SmashWords account. 2. Click on the Library link at the top of the screen. 3. Scroll down to Purchased Books. 4. Click on the book you want to read. This takes you to the book’s page, where you can scroll down and download the eBook format that works best for you. 5. When you click on the version of the book you need, the latest version will be available to download at the top of the list of versions. If you purchased your eBook from Amazon and the book is still on your Kindle, you should receive a notification that an updated version is available automatically. If it is no longer on your Kindle, you can get the latest version by going to your Kindle library and choosing to download the book again. You’ll get the latest edition automatically. Minor text corrections, and a preview of All That Remains. Author bio has been updated. Minor text corrections, and a preview of Back to Newtonberg. Author bio has been updated. Significant changes/corrections to the text, and a bonus short story: “Rick Murchison Goes Home Again.” Author bio has been updated. A new, single-volume book containing the complete text of all three books, including the new short story. Finally, for Amazon only I made an important change — if you order the print book, you can add the eBook for FREE. It’s only on Amazon because they’re the only company I have direct access to in order to set this up. 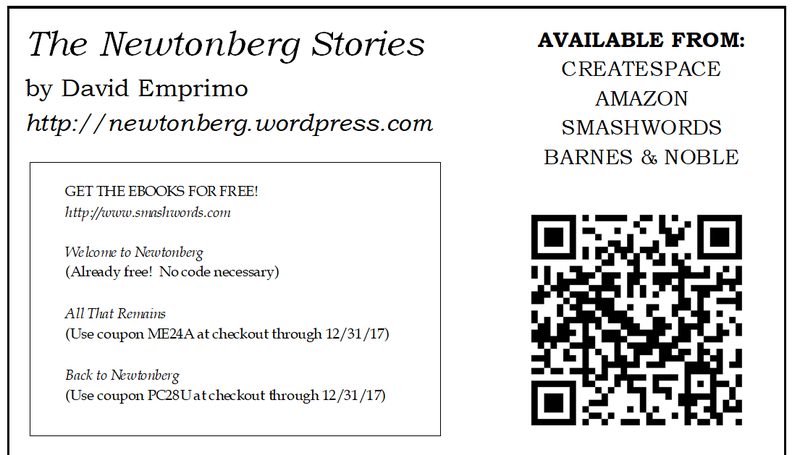 HOWEVER, if you do purchase a print edition and want the eBook, just shoot me an email to newtonbergpl@gmail.com and I will be happy to provide you with a SmashWords coupon code to get the accompanying eBook at no additional cost to you. Once again, I want to thank everyone for their support over these past five years (and before). I am beyond blessed to have such good friends, family, and others who have enjoyed meeting the citizens of Newtonberg. Rest assured that there is more to come — book four is already underway!